Modern heritage with an unexpected twist of sheer knit. 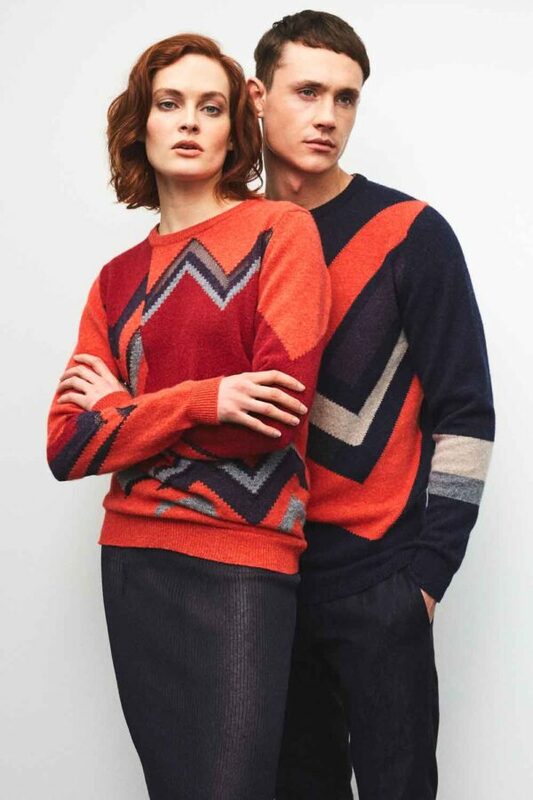 Introducing the Lena lambswool hand intarsia jumper with a contrasting geometric colour block. A chevron stripe of a vivid inferno, poppy red melange and sultry elderberry purple with a sophisticated contrast of dark purple viscose. A subtle yet seductive detailing of soft lambswool melange against a contrasting sheer viscose. A relaxed crew neck silhouette, wear yours with everything from jeans to leather skirts. A unique statement sweater entwining contemporary design, heritage skills and sustainable fibres. Made in the Scottish Borders, Lena lambswool Inferno jumper is handcrafted using a traditional heritage skill, Hand Intarsia. Embracing Slow Fashion, the Lena sweater takes up to 10 hours to knit. Please note there is limited stock of the Lena jumper.